Homely and satiating, Dal and Kadhi hold a special place in Indian dining! Wear your aprons, and get ready to try some of these simple yet delicious dals and kadhis, prepared using stomach-friendly ingredients like methi and dill. Mixed Dal recipe proves the fact that dal can be super tasty without being spicy. A mixture of three dals is perked up with tomatoes, onions and other ingredients, which give it a fabulous flavour. Since spicy meals trigger and aggravate Acidity. This Mixed Dal uses very little green chillies for spice. However, the chillies are not missed at all, because ingredients like ginger, coriander and cumin seeds impart more than enough flavour to delight the palate! Methi Koftas in Kadhi : Easy to make but superlatively delicious, this kadhi plays perfect host to delectable, non-fried, methi-flavoured koftas. These unique koftas are made with flours of multiple grains, perked up with lemon juice and ginger-green chilli paste. The koftas are steamed and not deep-fried, so they will not aggravate acidity. Neither the koftas nor the kadhi is spicy, so this dish is quite stomach-friendly. 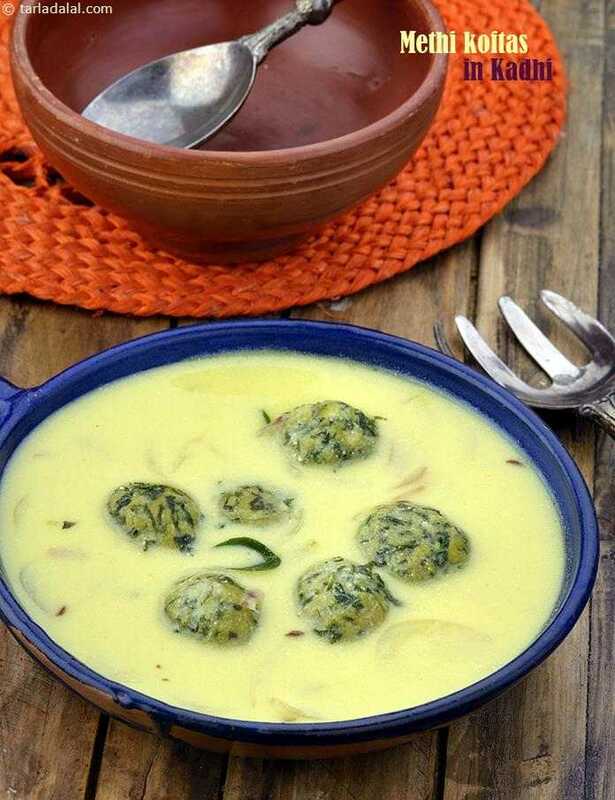 Serve the Methi Koftas in Kadhi for lunch along with fluffy phulkas .